Image caption White House budget director Mick Mulvaney told Congress on Wednesday that he went through the budget "line by line"
The White House has denied the president's budget proposal contains an "egregious" maths error. Former US Treasury Secretary Larry Summers pointed out the spending plan double-counts $2tr (£1.5tr). But White House budget director Mick Mulvaney told reporters: "We stand by the numbers." Unveiled on Tuesday, the budget proposes deep cuts to welfare programmes. Mr Summers, also formerly chief economist of the World Bank, was one of the first to spot the apparent mistake. "It appears to be the most egregious accounting error in a presidential budget in the nearly 40 years I have been tracking them," he wrote on his blog. He said the spending plan was "simply ludicrous". The budget forecasts about $2tr in extra federal revenue growth over the next 10 years, which it uses to pay for Mr Trump's "biggest tax cut in history". But that very same $2tr is then used to reduce the budget deficit. "My observation is that there appears to be a logical error of the kind that would justify failing a student in an introductory economics course," Mr Summers wrote. A prominent conservative economist agreed there was a discrepancy. Douglas Holtz-Eakin, president of the American Action Forum and former director of the Congressional Budget Office, told the Los Angeles Times the numbers "don't seem to match". But Mr Mulvaney said during a press briefing on Tuesday that the alleged gimmick was done "on purpose". "The money can be used to both reduce the budget deficit and offset Mr Trump's proposed tax cuts," he told reporters. He added: "There's other places where we were probably overly conservative in our accounting." That is not the only problem with President Trump's $4.1tr federal budget, according to analysts on both sides of the political divide. It hinges on the country achieving 3% annual growth, but most economists say this is unlikely for the US. The plan - titled A New Foundation for American Greatness - takes a hatchet to federal programmes for the disadvantaged, such as food stamps, disability payments and healthcare. Democratic lawmakers have savaged the budget, and even fiscally hawkish Republicans seem taken aback by the magnitude of the cuts. 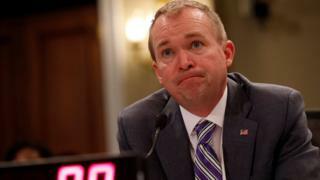 The austerity measures "are astonishing and frankly immoral", Congresswoman Pramilla Jayapal told Mr Mulvaney as he testified to the House Budget Committee on Wednesday. "This budget starts by taking away healthcare, then food, then housing, then education, then job opportunities," the Washington Democrat said. Former Democratic presidential candidate Hillary Clinton said the budget shows an "unimaginable level of cruelty" for millions of Americans and children. But the spending plan is likely to undergo substantial revisions on Capitol Hill before final approval.